Copyright, 1895, by Francis, Day & Hunter. Words by Lester Barrett Music by Lester Thomas. Pretty girls who seek for husbands who have pockets full of cash. Shady nooks and sly caresses, by the sad sea waves. So they formed a love engagement, as they strolled along the shore. Promised lovely diamond rings to, by the sad sea waves. And when he'd his mansion ready, they'd be married right away. 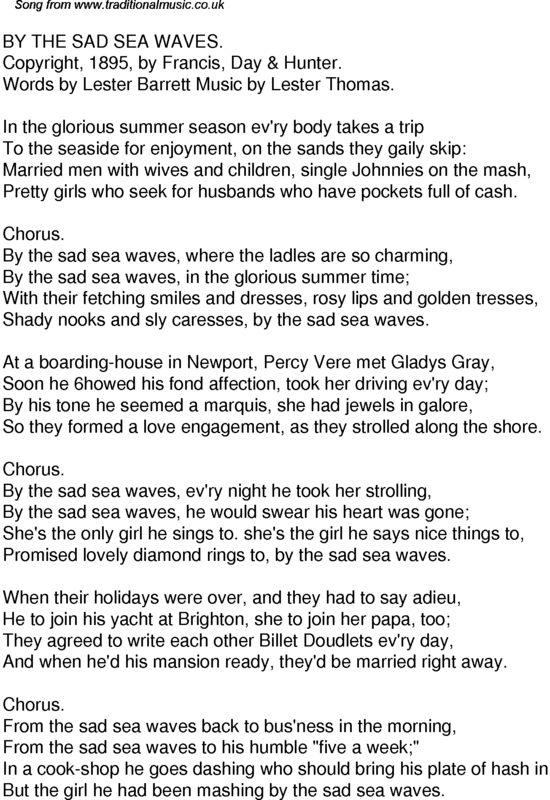 From the sad sea waves to his humble "five a week;"
But the girl he had been mashing by the sad sea waves.